Hanging of the Greens was a full celebration that welcomed more than 3,500 students to kick off the holiday season inside of GCU Arena. 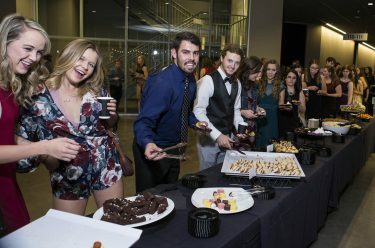 Students kicked off the Christmas and winter season Thursday night with one of Grand Canyon University’s annual festive traditions — Hanging of the Greens. A live band rocked the house at Hanging of the Greens. 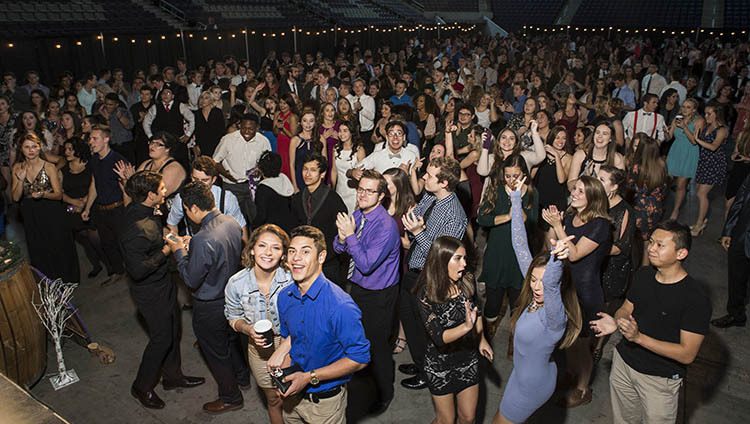 Dressed in their best bedazzled, colorful and stylish wardrobes, more than 3,500 students cheerfully celebrated throughout GCU Arena. Some pulled their friends onto the dance floor. Some lined up to take photos. And others climbed the Arena staircases, wrapped in garland and lights, to meet with friends, eat and mingle. They decorated Christmas ornaments to take home, made holiday cards, sipped hot cocoa and munched on plenty of savory desserts and goodies — from guacamole bruschetta and pesto wraps to cookies, mini cupcakes and M&M popcorn balls. 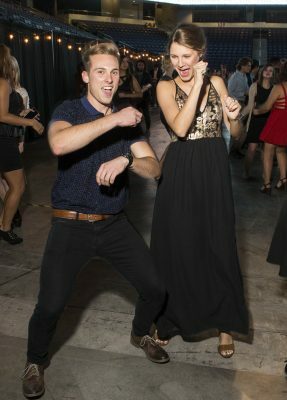 The night also included live music and plenty of laughs, pictures and dance moves. Martha Lucan and Jennifer Gutierrez sat together making their own hand-painted, personalized Christmas ornaments, which they said they planned on putting up in their apartment. Students showed off their dance moves. Preparing for an event like Hanging of the Greens can be a big task, and it took some serious planning, team effort and work to pull together. The Canyon Activities Board spent the entire day transforming the Arena as well as creating a custom photo booth for the two-hour event. Director of Student Engagement Jeremy Mack also contributed some chopped wood from his farm for the students to use as decorative props. A student designed a 10-foot ceiling draping of white silk fabrics and Christmas lights. The band for the night, Night Owl Productions, arrived from California. And Grand Canyon Beverage Company, the student-led coffee shop on campus, served guests warm drinks. CAB student leader Melanie Schissel could not contain her joy. Appetizers and treats made everyone happy. GCBC managers and student workers expressed excitement about being able to serve their drinks at another campus event. “It’s been such an awesome night and everyone has been so good to us,” said Noelle Soucek, a student barista. Hanging of the Greens began as a formal, sit-down dinner that at one time accommodated only 200 students. 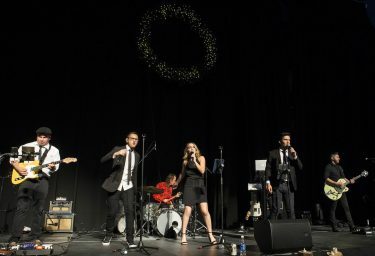 Throughout the years, CAB focused on making the event more of a holiday party that would create lifelong memories even after the decorations went down, said Schissel. But, most of all, to help students get into the holiday spirit.